Tree ferns and fuchsias in a large container collection at Longwood Gardens. Choose container culture for a myriad of special situations: close-up viewing of unique or rare specimens (and for a bit of horticultural braggadocio here), for species that have special soil requirements, for hobbies such as bonsai, for containing aggressive but, depending on one's taste, interesting collector's plants (Equisetum comes to mind), for portability of questionably hardy treasures that need to be moved for winter protection, or just for the joy of displaying and admiring a collection of plants that one would like to rearrange for seasonal decoration. Recorded flower pot culture goes back to Good Queen Hatshepsut of Egypt who ruled from 1503 to 1480 b.c. and sent, in 1495 b.c., information gatherers, including designated plant collectors, rowing and sailing for the Land of Punt (now Somalia) in what is believed to be the world's first oceanographic expedition. The explorers returned with an eclectic collection including, among other things, assorted fish (that based on temple drawings at Deir el Bahri can be identified down to the species level today), as well as ebony, ivory, frankincense, and, in clay pots, plants of the myrrh-producing incense tree. Pots, clay and otherwise, have carried treasures and introductions from afar ever since. Modern containers come in all sizes and designs, limited only by the imagination. The clay pots of yore, however, molting by inclination in winter frosts, have in many areas been supplanted by glazed ornamentals. Hypertufa troughs constructed with peat and cement, and carefully cured, are widely used to give a rustic appearance for the optimal display of alpine plants. Potential candidates for tufa culture should be chosen with care and caution, however, as the pot will leach small amounts of lime. Concrete pots, with the exposed aggregate styles being especially handsome, also slowly release lime into the soil. Wooden containers including the popular half whiskey barrels serve handsomely where a less formal effect is desired. They have a shorter life span but can be sealed with a wood preservative to prolong their usefulness. (Be sure to let it cure for at least a week before adding soil and plants.) For the specialist, little pots are appropriate for bonsai. (And yes, ferns of all sizes will reduce proportionately in pot culture.) In the whimsy class almost anything can pose as a container. 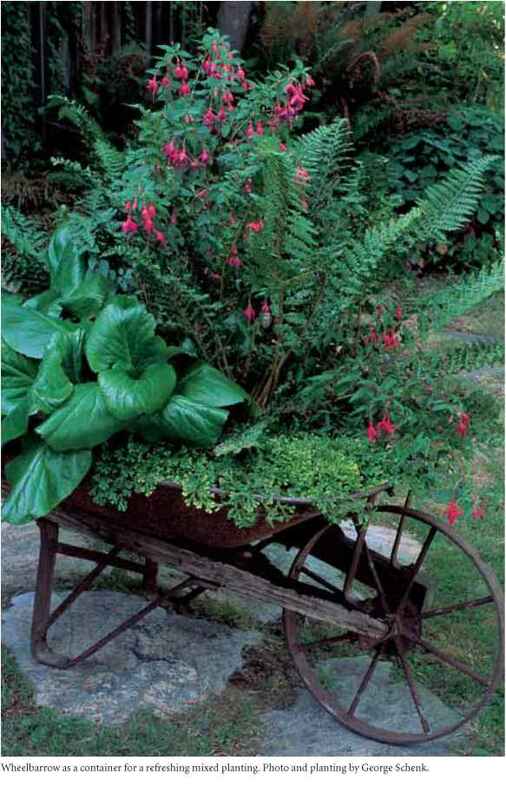 I have seen old rowboats, boots, and retired wheelbarrows all carrying the gardener's treasures. Baskets too are containers of sorts and popular for the ever-present Boston fern types. 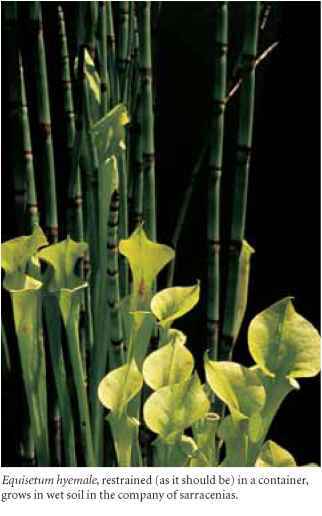 Many rhizomatous ferns display well in basket culture, the rhizomes themselves adding interest to the composition. In addition to the numerous nephrolepis culti-vars, pyrrosias, davallias, certain lycopodiums, and especially polypodiums, and their near relatives are strongly recommended for both indoor and outdoor features. The baskets are usually lined with sphagnum moss, but the newly available coconut by-products marketed variously as coir or coco-fiber inserts literally help the baskets and their contents to hang together. (I do not like coir as a soil additive or substitute, but it has no apparent ill effects as a basket liner.) A plastic saucer installed at the basket's bottom and used with the coir allows for more leeway between watering sessions. Traditionally, the basket's skeleton has been wire that, although many plastic shapes are now available, is still eminently suitable. With good horticultural husbandry, basket specimens will in time need to be extracted from their confinement. Short of major surgery, it is far easier and clearly kinder to the basket resident to take the cutting shears to the container rather than the plant, hence wire is preferred. Plastic baskets with their resplendent durability serve admirably well until this point of required expansion. Choose the container size with care, however, as ferns do not like to be overpotted. Without root penetration, surrounding soil will sour and eventually so will the fern. Give them companions or a root-ball appropriate-sized container and, when potting on, gradually move them up to larger sizes. For dryland ferns and those that require excellent drainage, tall narrow pots improve drainage. Aside from those mixes selected for specific soil requirements, normal, good draining, rich fern compost, with an emphasis on compost, will keep the container and contents in good health for many years. If you do not already have a favorite mix, try one part peat, one part washed pumice, a sprinkling of bark for drainage, and four parts compost or commercial soil mix. It is important to give the pumice a fierce hosing to wash away the talclike "fines" that will otherwise bind the soil and rob the container of life-giving oxygen pockets. Beware of an excess of peat, too, as once dry it is incredibly difficult to rehydrate. More than once I have seen pots soaking in improvised bathtubs for rehab. A saucer placed under the container for the summer serves as a potential reservoir and drought preventative, especially since a dry pot will drain water down the edges without ever watering the planting. A top dressing will aid in keeping a pot moist and can be soil specific, such as marble chips for lime lovers. Meanwhile, keep your ferns watered. Watering in the wintertime is redundant unless dealing, such as we sometimes do by choice, with xerics deliberately placed out of the path of winter wet. Attention to feeding is also a requirement in container culture. 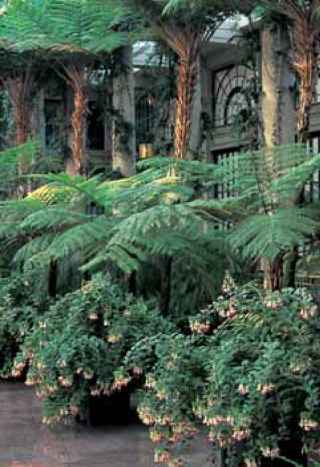 Good soil preparation enhanced occasionally with mulch will give garden-sited ferns years of contented vigor. By contrast, a container planting, including those sitting around in nursery pots waiting to be planted, will deplete nourishment and display displeasure with attendant poor growth and color unless periodically enriched. As with any feeding, my recommendation is for an evenly balanced, complete fertilizer applied at half the manufacturer's recommended strength. 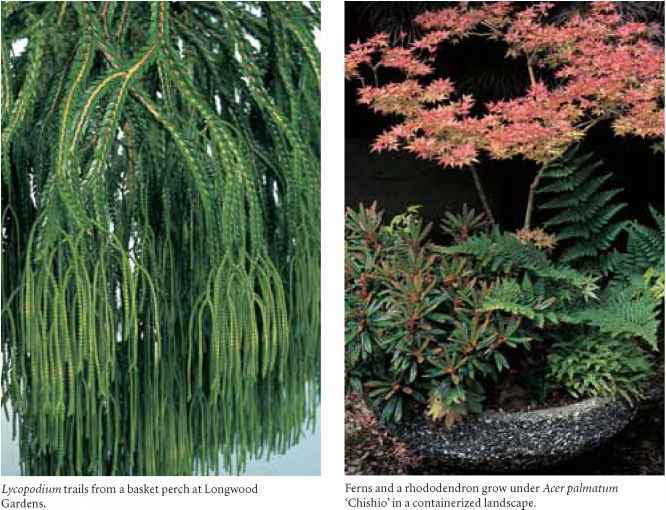 A spring infusion with a water-based fertilizer spray helps to get fronds up and about in vigorous health. Coated slow-release fertilizers that are blessedly easy to apply and last for months, but are heat-based for release, are best used as a supplement in early summer depending on your climate. 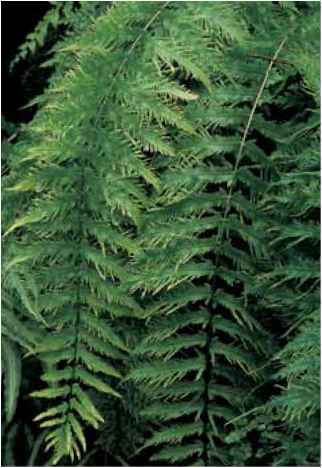 Do keep granular, including slow-release, fertilizers off of the ferns' crowns and foliage to prevent burning or disfiguring. And as another precaution avoid late-summer applications of any fertilizers for garden or container as they encourage late growth that is vulnerable to the vagaries of fall and winter weather. Finally, for the sake of drainage and for the health of the understory, pots of any type that will sit on a wooden surface are best raised with small tiles or those funny little feet sold in garden centers to save the wooden surface from the trouble of rotting. 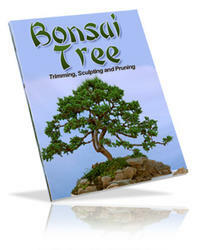 Secrets & Principles of Growing Bonsai Trees & Plants. Full illustrated pictures with full details and easy to follow.